If you are a Florida teen close to driving age, you've probably already heard some of your friends talking about what it was like to get their first driver license. Some might have discussed their experience with the behind the wheel skills test, like how difficult it was to make a three-point turn. Others might have mentioned how hard or easy the road signs and road rules test was. One common experience all Florida teens share is that they have to take the "drug and alcohol" course. Most teens these days are taking the course online, and you can too, by signing up with Florida's First Traffic School. Note: For questions not answered on this page, please consult our FAQ. "I was happy with the drug and alcohol course I took on your site, so I got my sister to sign up too." The drug and alcohol course takes about four hours to complete, but you don't have to do it all at once. When you register, you will receive a login code that you can use to log in and out of the course. This makes it very convenient for you to complete the course entirely on your schedule, either a small portion at a time or all at once if you prefer. We recommend that you complete one or two units and then take a break, which will allow you time to think about what you have learned. The course consists of 10 units that are approximately 20-30 minutes in length. Each page is timed to ensure that you spend the minimum amount of time on each topic. At the end of the course, you will be required to take a multiple choice final exam on the material you have studied. Along with reading the material, you will watch videos and complete interactive exercises. The exercises are "practice" only and are not graded. There are also Flash animations to illustrate certain topics, such as who must yield the right of way in a particular driving situation. The Florida drug and alcohol course teaches Florida teens several things. First, it examines the way alcohol affects a person's body, covering such topics as how senses, motor skills, and coordination are affected as a person drinks more and more alcohol. 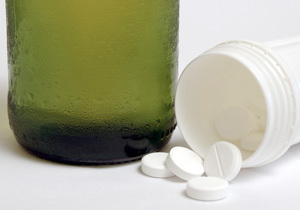 Second, the course examines the effects of alcohol on a person's mind. For example, alcohol puts a person in the "Child Attitude State," causing him or her to take risks and not use proper judgment when making important decisions. This is particularly dangerous for teenage drivers, who are inexperienced with both alcohol use and driving. Another area that is thoroughly explored by the drug and alcohol course is how drugs other than alcohol affect the mind, body, and driving. The effects of marijuana, barbiturates, inhalants, hallucinogens, and several other categories of drugs are all explained in detail, along with the short and long term results of using these substances. The last few units of the drug and alcohol course are dedicated to improving teen driving skills and decision making behind the wheel. Students are introduced to the IPDE (Identify, Predict, Decide, Execute) strategy for driving and shown how this strategy can be used to avoid a crash in various types of traffic situations, including rear and side collisions. The purpose of the drug and alcohol course is to present students with the facts about alcohol, drugs, and driving, in hopes that they will choose to be sober, and therefore safe, when they get behind the wheel of a motor vehicle. After you pass the final exam, your completion will be reported to the State of Florida electronically. Please allow up to 24 hours for this process to occur. When you visit the driver license or tax collectors office to apply for your Florida learner's permit, a driver license examiner will check the State's database to make sure you have completed the course. (You will also receive an e-mailed certificate of completion from our school, but most driver license offices will not accept this as proof of completion.) If the examiner sees that you have completed the course, your drug and alcohol course obligation has been fulfilled; you may then complete the other steps necessary to obtaining your license. Note that you can check to see if your completion has been reported to the state from your computer by performing the following steps. Go to the DHSMV Traffic School Completion Check page. Look for the section on the page that says "Search by date of birth and social security number or alien registration number, or other identifiying number for first-time driver (traffic law and substance abuse education) courses." Type in the required information and click the enter button. You should now see if your completion has been reported to DHSMV.